This Post is now outdated. Particularly the said bug is finally fixed. Not so long ago, remote unlocking of a LUKS-encrypted root partition was difficult to setup. While essential for headless servers, all required steps needed to be done manually and compatibility was a concern. Luckily, it is much simpler to do so in recent versions of Ubuntu/Debian. Unlocking an encrypted root remotely should be as simple as installing a single package… We’ll see about that in a moment. I am not going to cover the required steps for setting up LUKS/LVM here. That information is widely available on the net and is only a search a way. Instead, I’m going to do a quick review of the needed steps to enable remote unlocking of the said LUKS-encrypted root and also the issues you may encounter. Please note that this guide assumes you have a separate partition for /boot which is not encrypted. While GRUB2 now supports unlocking an encrypted boot partition, I do not believe that it could be setup to do so remotely. The steps presented here are tested in Ubuntu Server 17.04. May or may not work with other releases/Debian-based distributions. The process behind it is fairly simple. The kernel loads initramfs image. Inside this image are the required files/modules/scripts for decrypting/mounting root. Now if we could somehow run a SSH server in initramfs and make it accessible via network, one could connect to it to unlock root partition remotely. As initramfs runs in memory, we are somewhat limited in the size and complexity of the running programs. This is the main reason why Dropbear is being used as the SSH server and BusyBox, to provide shell and utilities. This special dropbear package which also contains the required initramfs hooks and scripts, make it possible to run an embedded SSH server in initramfs environment. When you install the package for the first time, it also generates dss,rsa and ecdsa host keys1, placed in /etc/dropbear-initramfs/. While the right thing to do, using a different private key for the Dropbear server will likely result in the client getting a scary warning about the possibility of a man-in-the-middle attack. This is because the server keys would be different before/after unlocking the root partition. The simplest (and possibly the best) way to avoid this issue, is to run the Dropbear SSH instance on another port. We will cover this shortly. 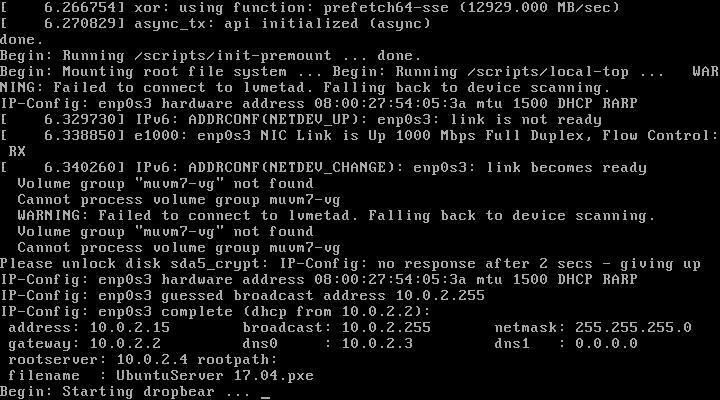 To make it listen on port 4748, edit the config file and add the following line: DROPBEAR_OPTIONS="-p 4748"
This would require that the kernel first recognizes the network interface (which is usually the case2), and also be able to setup IP parameters correctly. BusyBox v1.22.1 (Ubuntu 1:1.22.0-19ubuntu2) multi-call binary. Now this is where things start to fall apart. At the time of writing, there is an incompatibility between the cryptsetup and busybox-initramfs. The problem is that the cryptroot-unlock script uses some options of some utilities (in this case, ps), which have been stripped in busybox-initramfs to save space. This is a known bug which unfortunately has not received much attention. Since i really needed to be able to unlock my server remotely, and after much consideration, I came to a non-aggressive solution that would fix this. It would also make it unlikely to break things after an upgrade or when the bug is fixed. The fix is an initramfs hook file which is provided below.